Two events defined the Greek summer of 2018. Each signified a catastrophe on the widest social scale. The fires that consumed the seaside resort of Rafina and neighboring villages on July 23 killed more than 100 people and destroyed as many as 2,500 homes in Greece’s worst natural disaster in decades. Multiple small fires, whipped together by gale force winds and feeding off hillsides turned to tinder by severe heat and drought, swept through communities at warp speed, leaving them without exit by land and driving many into the sea, which claimed its own share of the victims. The disaster represented a perfect storm of natural circumstance and human contrivance. Town planning is virtually nonexistent in Greece, with homes and whole neighborhoods mushrooming illegally. The corollary is a lack of civic infrastructure and mapping, and consequently of evacuation strategy in the event of calamity. In the chaos of Rafina’s flames, police directed fleeing residents onto crowded roads, where some burned to death in their trapped cars. Overwhelmed, the government of Alexis Tsipras turned to the European Union for assistance. But the EU itself bore responsibility for the fire itself, as we shall see. Tsipras declared three days of national mourning. He also took full responsibility for the tragedy on himself. Whenever a politician does that, you know that he really takes none at all. No member of the government resigned. No effective investigation resulted, though officials themselves, prodded by public outrage, conceded that arson was the likely cause of the fires. Needless to say, no reforms have been instituted. Why arson? Because the fires that annually ravage Greece in the summer are in fact largely man-made, and in almost all cases entail human involvement. We have become accustomed to the fires that now sweep over the American West in an ever-expanding burn season. But fires of purely natural origin are in fact rare. In Greece, they have been estimated at fewer than three percent of the number that occurs. Some fires, in America as well as Greece, result from human carelessness or power grid accidents. But, in Greece as in other countries such as Brazil and Indonesia, arson is commonplace. The cause is most frequently not simple wickedness, but greed. Arson in Greece is land clearance for the construction of illegal housing. Individuals set them; so do developers. The purpose is to access protected forest areas and to evade taxation. Such housing dots much of Greece, mostly brazenly around Athens. Successive governments have turned a blind eye to the practice for decades or been induced to by bribes. When such squatting is “discovered,” the culprits typically compound for legal violations and back taxes at a fraction of nominal assessment. Some of this involves pure corruption. But, since 2010, it has been aggravated by the desperate need of the government to raise funds to meet the demands of the EU-imposed austerity regime. In effect, the government has traded a short-term infusion of cash for the national patrimony in order to recapitalize German banks. That gives the EU a stake in those incinerated in Rafina and Mati. Tsipras is not alone in Greece’s capitulation. The previous administrations of PASOK and New Democracy, under the threat of a forced bankruptcy and a cutoff of vital credit and supplies, meekly submitted to Berlin’s orders. It was a popular rebellion against this sellout that brought them down, effectively destroying PASOK and enabling Tsipras’ hitherto minuscule Syriza Party to gain power in January 2015 on a platform of rejecting further austerity demands (although not repudiating the previous dictates that had crushed the Greek economy and led to a population exodus). The ensuing debacle is well known and needs little recounting at this point. Tsipras, it soon transpired, had no political or economic strategy behind his bluster, and merely provoked the wrath of his masters instead. Given renewed support in a popular referendum, he collapsed utterly when Merkel the Merciless waved her wand, and her minions publicly bludgeoned him in Brussels in a manner befitting a Roman triumph. 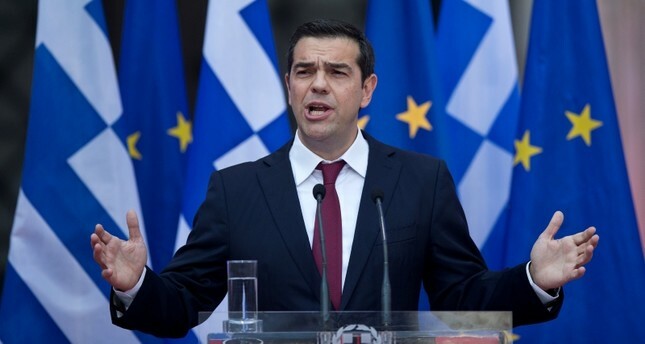 The further austerity terms imposed on Greece were certainly worse than even Tsipras’ lickspittle predecessors would have suffered, the due punishment of anyone defying the New European Order. No loans were forgiven, but further ones inflicted that would bind the Greek economy to its creditors for decades to come. Wages and pensions, already gutted, were to be cut further, and taxes simultaneously raised on the remnant. Basic infrastructure and services were auctioned off to foreign interests, public and private. Nothing was left for capital investment by Greece itself, but only through the country’s new owners, whose profit was a further tax on the Greek people. Greece had ceased to be a member of the European Union; it had become its first colony instead. It didn’t have to be that way. In the year of Greece’s abjection, 2015, Portugal, a country comparable to it in size, population, and economic output and comparably suffering under the yoke of austerity, also elected a center-left government on an anti-austerity platform. But its leader, António Costa, flew under the radar of international attention, doing rather than talking. He reversed previous cuts to wages, pensions, and social security, spent modestly but tellingly on stimulus programs and business incentives, and, without spectacle, shrugged off threats of reprisal from Germany and the International Monetary Fund (IMF). At the same time, he cut back on longer-term infrastructure projects of less immediate impact to pare back Portugal’s chronic deficits and make demonstrable progress toward meeting the EU’s mandate of a balanced budget by 2020. Costa’s gamble was that assisting small to midsize businesses and raising general purchasing power would revive the economy while generating enough revenue to contain public expenditures. Part of his calculation was in dollars and cents, but part of it was also those elusive birds, business and consumer confidence. It was not a magic formula, and it has not worked a miracle. More straightforward Keynesian stimulus would have produced better results. Gig labor has cut into wages, and unions are restive. Income inequality remains. But there are manifest signs of recovery. Unemployment has been reduced to pre-crisis levels. Production and exports have rebounded. Foreign investment has returned, not as predatory scavenging but as a taxable enterprise. Portugal has become a going business again. And it has done so without selling its soul. The contrast with Greece could not be more striking. On August 20, Greece officially exited the $375 billion bailout program that supposedly staved off national bankruptcy, but in fact has only been the gun pointed at its head to enforce the amputation of its economy and the looting of its patrimony. The real meaning of the event is that Greece is now poor enough to service its debts—themselves far larger than ever—thanks to the combination of brutal taxation, slashed services, and confiscated assets that have produced a nominal budget surplus on a pile of ruin. It will never, needless to say, be able to pay them down, nor at any foreseeable time escape the international controls now institutionalized by its creditors. As part of the exit “deal,” Tsipras has pledged Greece to maintain an annual budget surplus of 2.2% until 2060, with surveillance by the EU and the IMF to ensure compliance. Public property, if any is left, will likewise be subject to external control (read: confiscation) until 2114—a century of serfdom. What’s already been sold off, or put on the chopping block? Ports and airports; railways; electric, gas, and water companies; seashore areas; archaeological and cultural sites; mines; theaters; and even courthouses. Foreclosed homes have been put on an electronic auction block, to facilitate private dispossession as well. The EU has congratulated itself on the Greek exit, and Tsipras put on a tie for the occasion. The IMF, which has fewer political interests to protect and which refused to participate in the final bailout, acidly commented on the “very ambitious assumptions” about Greece’s potential for sustainable growth and fiscal discipline over a more than four-decade period: assumptions no one would make about even the richest and most robust economy, let alone one battered into the dust by the party demanding them. In fact, the “exit” is no such thing, but a formula for permanent subjection and control, just as the “bailouts” were not about pumping out a sinking ship, but only adding bilge to it. What is the actual condition of Greece today? Official statistics point to a minuscule 1.4% growth in the economy last year, after a loss in the previous eight of more than a third of its value. Unemployment is reportedly down from a high of 28% to a current 19.5%, but those numbers, grossly undercounted as they are, take no account of what “work” is now available. Wages were cut by 50% or more (when paid at all) for many who kept their jobs as the economy plummeted, and that level has become the new norm both for newer and older workers alike. In other words, in a country with a poverty level above a third, income standards have been halved. That is a formula for permanent immiseration—and, need one add, exploitation. In this respect, too, Greece has shared the fate of Third World nations caught in debt snares and crushed by depression. Such is the terrible and, as the IMF points out, an unsustainable legacy now foisted on Greece by Alexis Tsipras. It need not have happened. Portugal found another way. Greece, too, will have to. The circumstances of 2015 have radically changed. Then, German hegemony was unchallenged, and Angela Merkel was the chancellor of Europe. Now, she is a gravely weakened leader in a divided continent. The European Union looks less and less like its future, and more like its past. The institutions that have shackled Greece to an odious debt—the financial term of art that means one that has no legal or moral claim to payment—may not survive. They will certainly have to change. In 2015, Greece was singled out for punishment by the German-dominated EU. Today, the hard line being taken with Britain over the Brexit reflects a similarly punitive approach. Instead of dealing with the grievances that led to the Brexit vote, it insists on exacerbating them. The EU is not about open borders, but cheap labor. It is not about democratic procedure, but currency control. And it has made clear over the past decade that Greece, which gave the world the ideal of freedom, is fit now only for slavery. I don’t make this point lightly. Two hundred years ago, Greece rebelled against the Ottomans, under whose rule they were in many respects better off than they are now. The task of liberation today won’t be accomplished by arms. But it will require no less fortitude, ingenuity, and resolve. Getting rid of Alexis Tsipras is the first place to start. Robert Michael Zaller is an American author whose works include volumes of history, criticism, and verse. 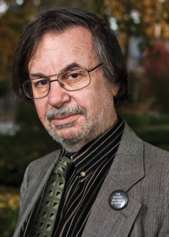 He is a Distinguished University Professor of History at Drexel University.